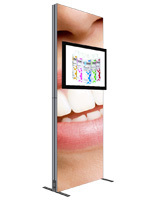 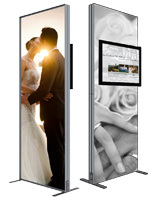 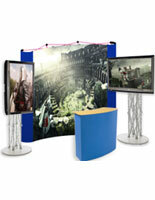 Need a way to show an interactive display at an event? 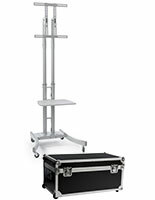 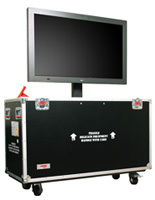 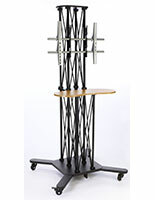 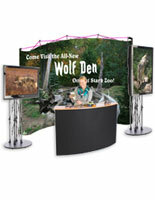 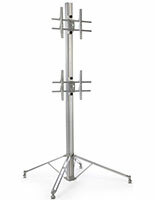 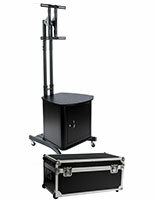 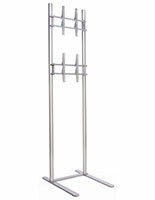 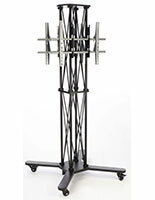 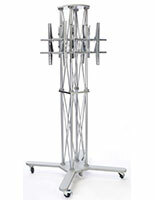 This trade show TV stand comes in an assortment of convenient designs for simple set up and disassembly. 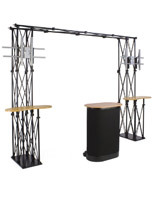 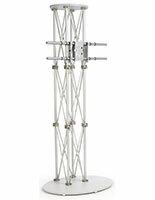 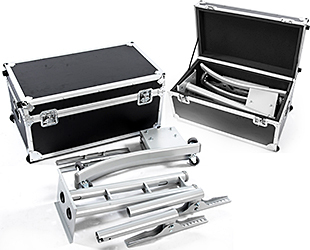 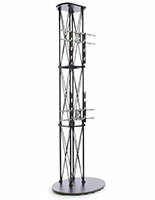 Some models feature a truss construction that is both sturdy and quick to knockdown, making them great for temporary setups. 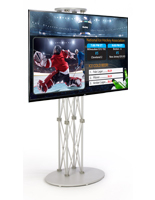 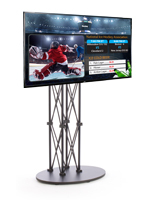 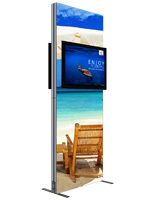 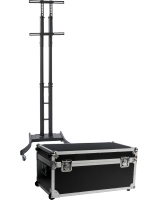 A trade show TV stand, or portable monitor stand, elevates your flat screen TVs for grabbing the attention of distant passersby at crowded events. 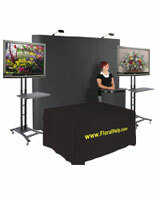 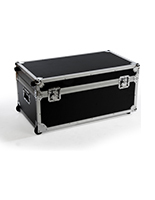 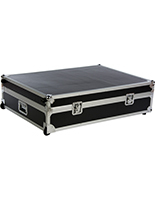 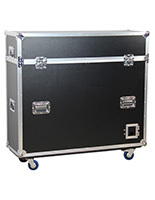 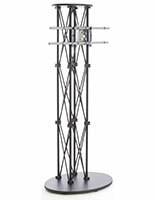 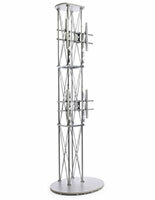 Each tradeshow fixture is available in either a neutral black or silver finish that blends with any interior. 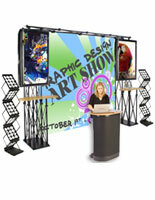 Some trade show TV stands come with a shelf for distributing promotional materials like brochures, catalogs, and merchandise samples. 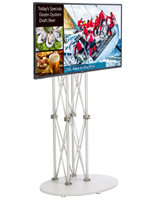 Which trade show TV stand is the best one for your company or business? 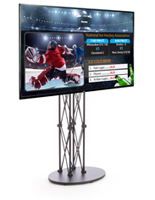 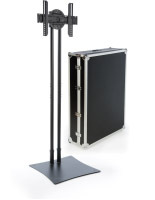 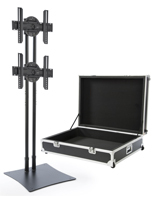 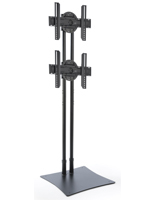 If you are simply looking for a fixture to display a TV in your booth, then any one of our straightforward stands with no added accessories will do fine. 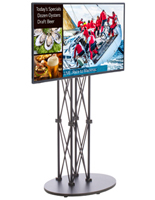 Models featuring shelves or tabletops increase the value of the display fixture by providing more space for takeaway literature or room for a salesperson's laptop or other electronic device. 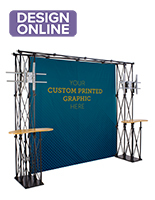 Complete trade show solutions, such as the composite groupings of stands, literature racks, and printed backdrops, offer a convenient way to outfit your trade show booth with one-stop shopping. 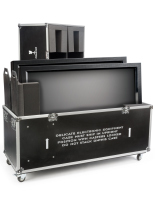 And the thing to remember is that every one of these portable displays knocks down into their own travel case or canvas bag for transporting.